CHAKRA produce several type of tea, you can see our tea grade list. The plucked leaves are collected in a basket or bag carried on the back of the plucker and when this is full it is taken to a collection point where the plucked leaf is weighed before being taken to the factory for processing, or "making", as tea manufacture is known in the tea trade. If pluckers are harvesting an area near the factory they will take their plucked leaf direct to the factory for weighing. On an estate, each plucker is credited with their own weights of tea for subsequent payment. A skilled plucker can gather up to between 30-35 kilogrammes of plucked leaf in a day, sufficient to produce about 7.5 to 9 kg of processed black tea. As black tea has the major share of the tea market in terms of production, sales and amounts drunk, most tea factories produce black tea. On arrival at the factory, the plucked leaf is spread on vast trays or racks, normally placed at the top of the factory, and are left to wither (as shown below) in air at 25-30 degrees centigrade. The moisture in the leaf evaporates in the warm air leaving the leaves flaccid. This process can take between 10 to 16 hours, depending on the wetness of the leaf. Some factories will gently hasten the process with the aid of warm air fans. The withered leaf is broken by machine so that the natural juices, or enzymes, are released and on contact with the air will oxidise. This breaking is done by two methods "Orthodox" and "Unorthodox" - terms are used to describe the machinery used. The Orthodox machine rolls the leaf, which produces large leaf particles, known as grades. 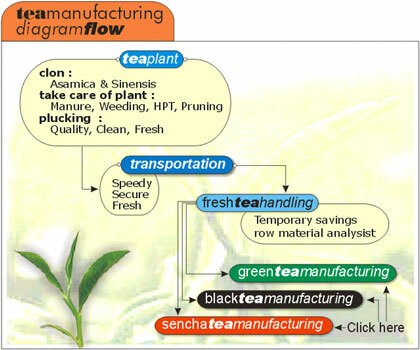 While the "Unorthodox" term covers teas broken by either a CTC (cut, tear and curl) or Rotovane machine. Both chop the leaf into smaller particles than those which are produced by the Orthodox method. The smaller particles are more suited to modern market demands for a quicker brewing finished product. The broken leaf is laid out either on trays or in troughs in a cool, humid atmosphere for 3-4 hours to ferment, or oxidise, and is gently turned every so often throughout the period until all the leaves turn a golden russet colour and fermentation is complete. After fermentation, the leaf is dried or fired. This is done by passing the broken fermented leaf slowly through hot air chambers where all the moisture is evaporated and the leaf turns a dark brown or black. The black tea is ejected from the hot chamber into chests. Next it is sorted into grades, or leaf particle sizes, by being passed through a series of wire mesh sifts of varying sizes into containers before being weighed and packed into chests or "tea sacks" for loading onto pallets. Factory tea-tasters will taste the finished make to ensure that no mistakes have been made during the manufacture or that the tea has not been contaminated by anything within the factory. Samples of the make are sent to selling brokers worldwide. All brokers will evaluate the tea for quality and price, reporting back to the estate or co-operative, so the tea can be sold to the best advantage. After each "make" the tea factory is washed from top to bottom to ensure that the completed make does not contaminate the next make of tea. We give extra care to each step of our tea process to achive a high quality tea.This picture above show you our extra care to the tea process flow.